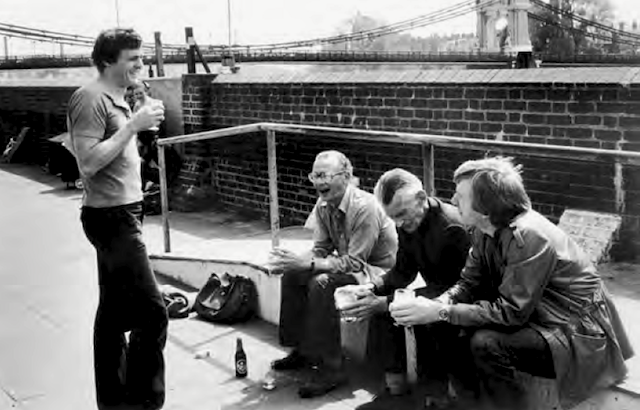 Samuel Beckett in London, taking a break with the San Quentin Drama Workshop. Left to right: David Hare, Alan Mandell, Samuel Beckett and friend. Papers to be presented at the SBWG are distributed and read by all the participants ahead of the meeting. At the SBWG session presenters give short resumes of their work, followed by a lengthy discussion period (each presenter has 45 minutes in all). This is an extremely effective method, which allows ideas to be discussed, debated and evaluated, with participants suggesting directions for presenters’ works-in-progress. There is limited space for presenters, so do get in touch as soon as possible to guarantee a place; there will also be a limited space for auditors, who would also be sent the papers to read and encouraged to engage in the discussions during the sessions. ‘Levels of Imagery (audio and/or visual) in Samuel Beckett’s Drama. Images that respond to pre-existing performances, such as those in earlier productions of Beckett’s drama, to other theatre genres, to other playwright’s work or to other mediums (e.g. from adaptations from page or radio to the stage). Do get in touch with Julie Campbell (j.campbell@soton.ac.uk) if you have any questions. Warwick will send acceptance emails by 21 February. The reason for the early deadline is a) so that all delegates have a fair chance of getting their preferred accommodation on campus which opens (along with registration) on 1 March 2014 b) to ensure there is adequate time for delegates to apply for Visas, as the UK Visa system can take several months for these to be processed. Papers (length 5,000 words) are to be distributed by the end of May, 2013.